Monday 26th February- Today we carried out an experiment to find which materials created the most static. We had lots of fun with lots of materials, including ourselves, to see how much static we could create on a balloon. Friday 19th January- Today we looked at solids that we thought would melt when we added heat. We measured their melting point. Friday 12th January- Today we started our new topic, States of Matter. We sorted different Solids, liquids and gases and also acted as particles within each matter. 22nd November- Today we focused on pitch. We looked at the difference between low and high pitch sounds and the different sound waves they produce. 17th November- Today we learned all about sound waves, we even created some of our own. We looked how the vibrations change when it is a loud or quiet sound. 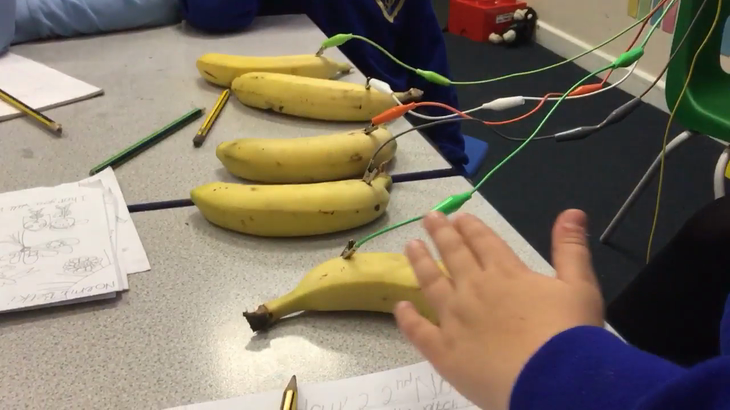 Monday 6th November- Today with started our new science topic, SOUND. We looked at how the rice vibrations differently depending on how hard or soft we banged the instrument. We learned that that the louder the bang the bigger the vibrations, causing the rice to jump up higher. Monday 23rd October- Today we completed a science experiment that involved lemonade and sultanas. We predicted what we thought would happen when the sultanas where put in to lemonade. See if your child can explain to you what they observed and why it happened. Monday 16th October- Manchester science and industry trip. Firstly we had a lot of fun looking round and trying all the different experiments such as the shadow maker. Then we watched a show all about electricity (which is our science topic) it was really fun and we learned lots. Finally we looked at all the old aeroplanes and types of transport. Thursday 28th September- Today we looked at conductors and insulators of electricity. We had to guess which materials would be good conductors of electricity then build a circuit to see if we were right! 19th September- Our science topic for this term is Sparks might fly! Today we tried to make simple circuits. We also looked at light bulbs and discussed how they work.